If you’re having a dispute with someone and communicating with them via text message, can those texts be used as evidence in a court of law? The answer is yes. . . and no. Text messages aren’t automatically admissible in court. Steps must be taken to properly preserve the texts as evidence or they won’t be allowed to be presented in your case. 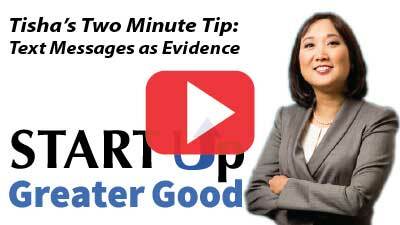 In this week’s two-minute tip Tisha explains how you can preserve your texts so they can be used in a court of law. Watch the video below to learn more.